Israel Day Parade in New York City. New York Jews prevail over Arab protesters. After lesser skirmishes in more vulnerable enclaves, Arabs and their supporters got clobbered, metaphorically speaking, when they confronted what is arguably the mightiest Hebraic force on earth: Jewish New Yorkers, a few of whom responded with a Bronx cheer. Jewish New Yorkers honored Israel’s 60th anniversary by defending their turf and prevailing over advocates for Arabs living in Israel’s territories during the annual Salute to Israel Parade on June 1. As a cast of 100,000 marched 22 blocks up Fifth Avenue, mostly alongside Central Park, 50 protesters were relegated to a short block in front of Plaza Hotel between 58th and 59th streets where they mostly held Palestinian flags and placards which predicted Israel’s destruction and accused the Jewish state of causing apartheid, occupation and ethnic cleansing. When I passed by the scene, two onlookers across the street from the demonstrators screamed “Hitler” and “fascists.” Adults and children in one large parade group waited during a lull in front of the demonstrators. Nothing was said, but there were expressions of disdain and fear on the faces of some marchers. Otherwise, I witnessed no serious incidents, and the media reported none. In fact, the media generally ignored the parade. Fears that North America’s grandest celebration for Israel might be disrupted were allayed. The Jewish Telegraphic Agency posted a long article a few days earlier raising such concerns because of disturbances in other cities, including Philadelphia. It is mainly heavily pro-Arab towns like Boston and San Francisco where Israeli celebrations are disrupted, but this year the 60th anniversary has been avidly hyped. New York City contains the largest Jewish population in America, with 1.7 million Jews living within a 35-mile radius of the parade route. 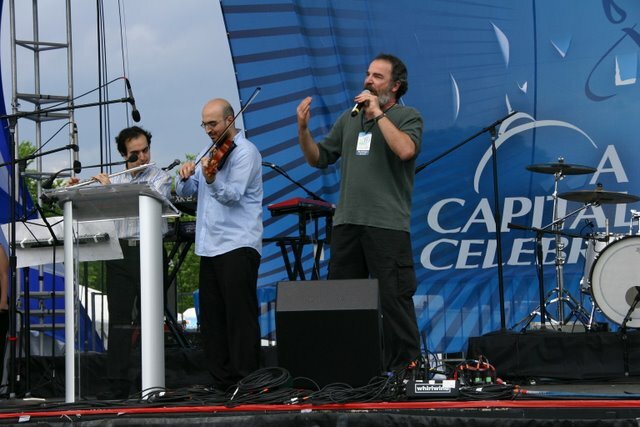 Meanwhile, The Jewish Federation of Greater Washington organized "A Capital Celebration" on the National Mall. New York accomplished what Israel cannot yet do: contain its troublemakers. New York is the place for Jews in the United States. In 1654, 23 Jews from Brazil launched an unstoppable trend when they settled in Manhattan. The Jewish people are entrenched in New York and nobody can drive them out -- except, well, to Scarsdale or Great Neck. It is one thing to bully Jewish communities in Boston or Milwaukee, but anyone who takes on New York Jews and, well, New York in all its power must be certifiable. When I observed that single parade group standing in front of the demonstrators, I wondered what might ensue if the marchers felt antagonized enough to rush them? Who would stop them? Who would stand between these interlopers and these "mad, enraged Jewish New Yorkers"? "Allah will destroy the terrorist state of Israel." "God will send the mushroom cloud from the sky on Israel. " Most provocative was a poster depicting a bearded Jew with a stereotypically large nose, next to this message: "Happy Birthday, you cheap, cowardly murderous apes." And they expect people to take them seriously?